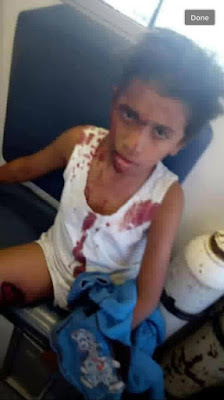 Egyptian Chronicles: Minya once again : At least 7 Egyptians killed in another terrorist attack , another black Friday in Egypt "Updated"
At least 7 Egyptian Christians were killed and 14 others were injured Friday afternoon in a terrorist attack near a desert monastery in Upper Egypt’s Minya Governorate Friday afternoon in one of the desert roads. In the first early reports that unknown gunmen opened their fire on a bus carrying people coming from Minya to visit a monastery in the desert. The Coptic Orthodox Church issued a more detailed statement about what happened. Gunmen opened their fire on three buses heading back from Saint Samuel the confessor monastery in the desert of Minya using a back route. At least Seven people on one micro-bus from Minya city were all killed whereas at least 13 people of another microbus from Minya also were all injured and currently being treated in hospitals. 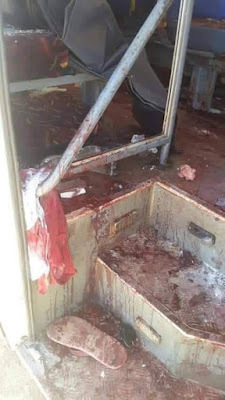 A bus carrying 28 passengers from one family coming from Sohag to attend the baptizing of a baby from the family was also attacked but only 6 passengers were injured. According to the list of victims killed in the attack released by the church, May God bless their souls, six of them were from the same family. Many of the injured victims were women and children. As you can see the Church is the one that issuing statements by names and details not the government as supposed because we are speaking about Egyptian citizens. This attack is a copycat of the attack that targeted also a group of Christians heading to St. Samuel the Confessor also in May 2017 if you remember it. You may ask where the security was and why this would happen again after a year and a couple of months. Well, security officials say that that convoy used a back unguarded route because the main guarded rout was closed down. With my all due respect, I find that excuse is insulting because I thought along with many Egyptians that such convoys were accompanied with security vehicles. My aunt asked me that direct question as she heard the incident "Where are those security vehicles that follow them? It seems that we assumed wrong after all. The response of the officials is always too late when it comes to the media. The first source that spoke before anyone, as usual, is Father Makarios, the Bishop of Minya and Abu Qirqas who spoke to the media first before the Coptic Orthodox Church issued its official report or even the government officials. Currently attending the World Youth Forum in Sharm El-Sheikh, Egypt’s President Abdel Fattah El-Sisi tweeted from there sending his condolences to the families of the victims asserting the intention of the Egyptian government to continue its efforts against terrorism. 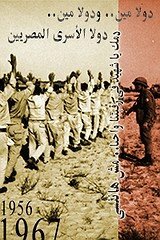 أنعى ببالغ الحزن الشهداء الذين سقطوا اليوم بأيادٍ غادرة تسعى للنيل من نسيج الوطن المتماسك...وأتمنى الشفاء العاجل للمصابين واؤكد عزمنا على مواصلة جهودنا لمكافحة الإرهاب الاسود وملاحقة الجناة. He also spoke with Pope Tawadros II, the head of the Coptic Orthodox Church. No national mourning has been declared so far. It seems that the focus of the Egyptian state-owned and mainstream media are focusing alone on the second edition of the World Youth Forum “WYF” in Sharm El-Sheikh. 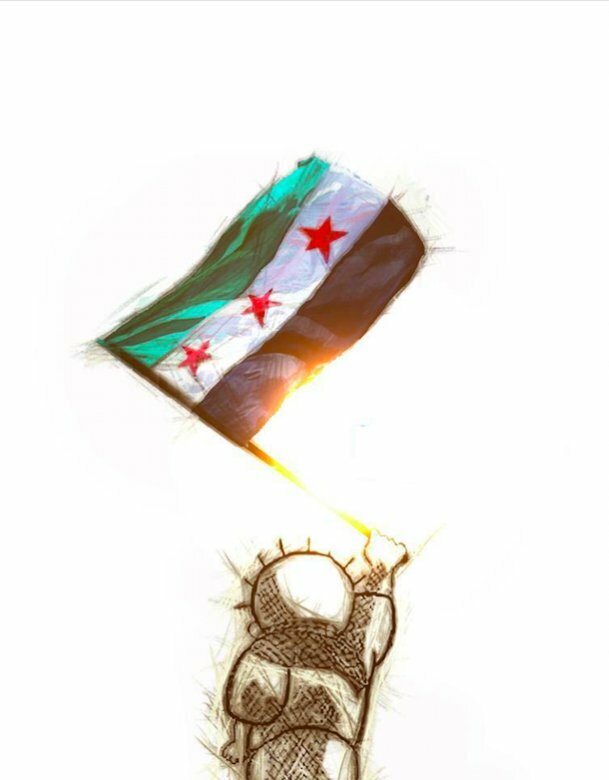 Some Pro-regime media figures and supporters say that that the attempt of the “black terrorism to spoil the WYF”, Well I think the terrorists who did that do not care much about WYF in its second edition. They want to send a message that they are still here to both the regime and the world. Publicly, the Egyptian people were caught off guards on Friday as millions of Egyptians are following the final CAF Champions leagues football match between Ahly SC and Tunisia’s Esperance in Egypt. 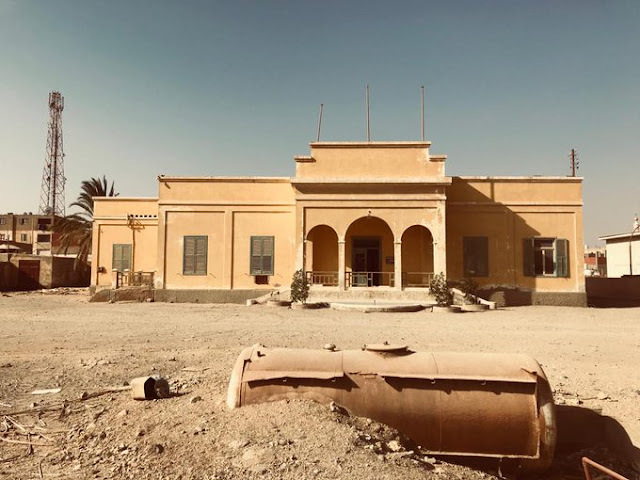 Personally, knowing how the Egyptian authorities react based on past experience, the trips to desert Christian monasteries will be suspended until further notice. Within hours at most 48 hours or less, a some-Daesh-affiliated group will declare its responsibility. 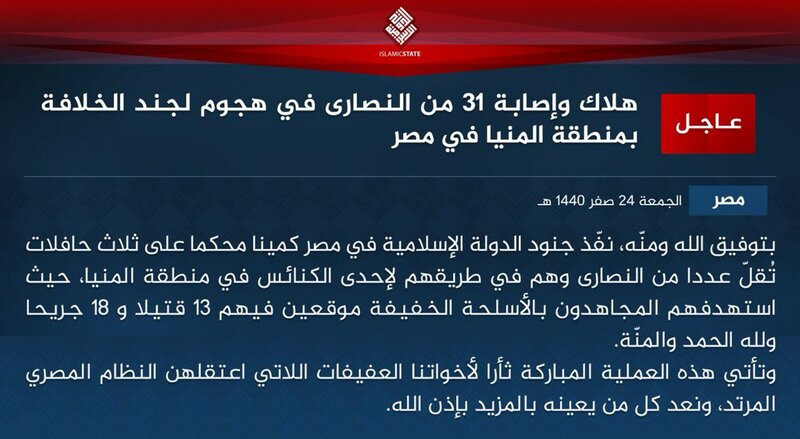 Daesh has claimed its responsibility on social media for the attack claiming that 13 people were killed instead of 7. It claimed that the attack came as retaliation for the arrest of "pious sisters" earlier this week by the " Egyptian apostate" government. On Thursday, the Egyptian authorities arrested a number of 19 human rights, activists and people, mostly related to the Muslim Brotherhood. That's a very quick alleged reaction in less than 24 hours considering the fact that the attack was at a back route in the desert of Minya. I think that cell in Minya is too active to the level of planning and executing an operation like this in 24 hours. Many of them are women according to what I read including prominent lawyer Huda Abdel Moneim and Aisha Khairat El-Shater, the daughter of the MB deputy Khairat El-Shater who is currently in prison. Personally, I think Daesh is seeking new supporters among the MB young members and supporters who are angry currently because of the current raid against the MB sisters. Either way, that statement is technically throwing those women under the bus as publicly it gives the Egyptian government a solid evidence to present to the world and the Egyptians on the connection of Daesh and MB, which MB leading figures deny. "Those abroad outside jail of course"
Needless to say the MB or whatever branch of it that still runs Freedom and Justice Gate in Arabic ran a piece saying that the attack with false flag operation. Days later, Egypt’s ministry of interior will declare the liquidation of some terrorist suspects liquidating in Minya desert and people will forget till I am afraid the next terrorist attack. It is like a freaking Deja vu that does not want to stop. 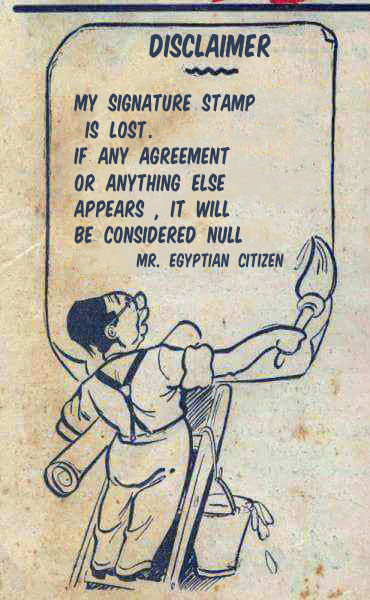 I feel that I have already known what certain people in Egypt will say and do. The attack this time came before Christmas, which means there is enough time to secure Christian Churches and gatherings as well. May God have mercy on all of us. May God bless the souls of the dead and bring patience to the living.